As it turns out, it wasn’t half bad. Apparently, a lot of ketchup goes a long way in making up for flavoring with spices. Who knew? The texture was light and fluffy, not what you’d expect from a meatloaf and I’m guessing that’s because of all of the breadcrumbs in the recipe. 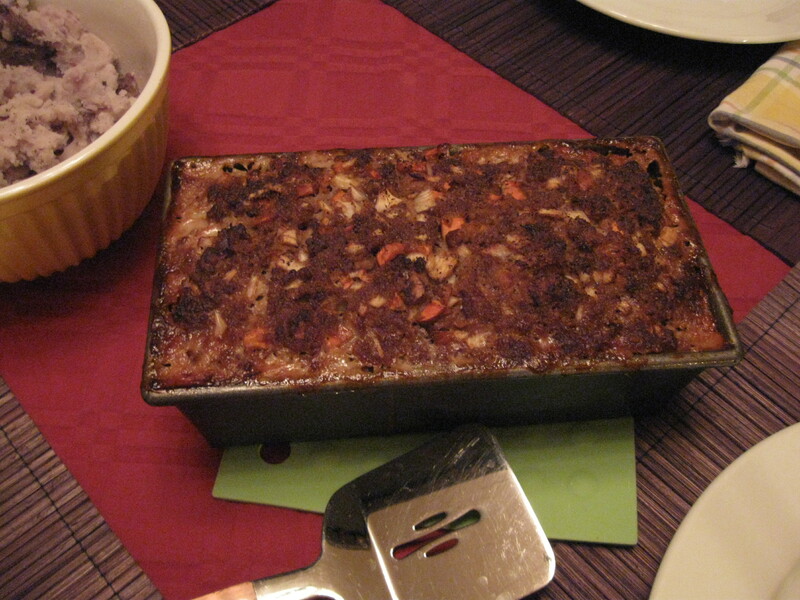 (We used fresh breadcrumbs instead of canned – BIG DIFFERENCE.) But it definitely wasn’t the “gourmet” version I had become accustomed to making. Suffice it to say, my grown-up version of meatloaf has matured. A lot. It’s very loosely based on a Martha Stewart recipe and it’s a staple in our household each fall. I usually serve it with mashed potatoes or turnips and either steamed broccoli or peas. My version is a bit denser, but I love it because it tastes really hearty and rarely are there any leftovers. Actually, come to think of it – there weren’t any leftovers of Madison’s meatloaf either. Maybe we just like meatloaf. Or maybe, Madison will turn out to be just as good a cook as the rest of us. 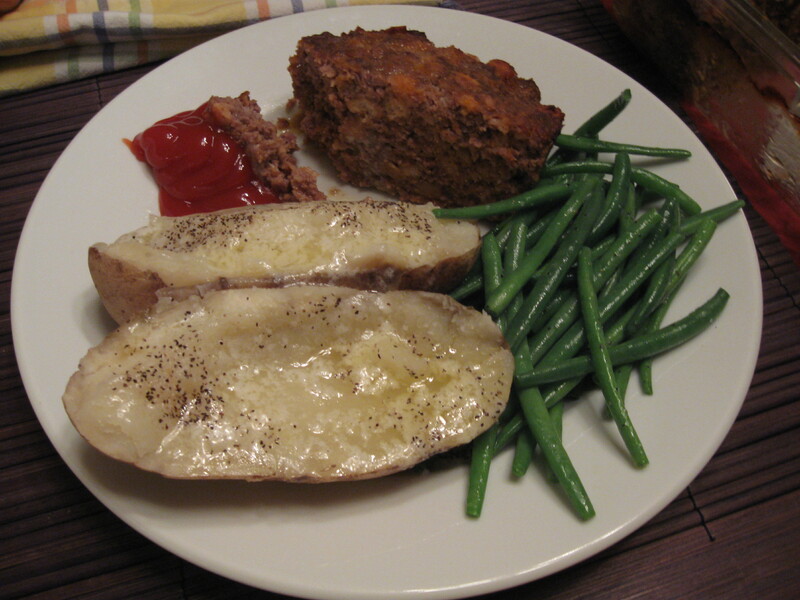 You be the judge: Which meatloaf looks yummier? Preheat oven to 350 degrees. In a large bowl, combine all ingredients and mix well with your hands. (Madison loves “mixing the brains”.) Place the mixture in a 9x5x3 loaf pan and pat the mixture evenly with your fingers to make the top smooth. Bake for 1 hour and let stand for 10 minutes after removing from the oven. Preheat oven to 350 degrees. In a large bowl, combine all ingredients and mix well with your hands. Place the mixture in a 9x5x3 loaf pan and pat the mixture evenly with your fingers to make the top smooth. Bake for 1 hour and let stand for 10 minutes after removing from the oven. When my parents were living with us, we would have to make two meatloaves. One for the boys (John, Jacob, Ian and my Dad) and one for the girls (me and my Mom). The boys one was probably pretty close to Madison’s, but the one for the girls had onions, green and red peppers, tomatoes–very chunky. Yum. The boys didn’t know what they were missing. And since we had two meatloaves there were left overs, which make great cold meatloaf sandwiches! oooh, the peppers sound good. I may have to try that for a summer turkey loaf. Thankfully she loves the kitchen! They both looked great.. How diplomatic was that…. I am just glad she got the cooking gene. I also like that she isn’t a real junk food eater. Thanks Heather. 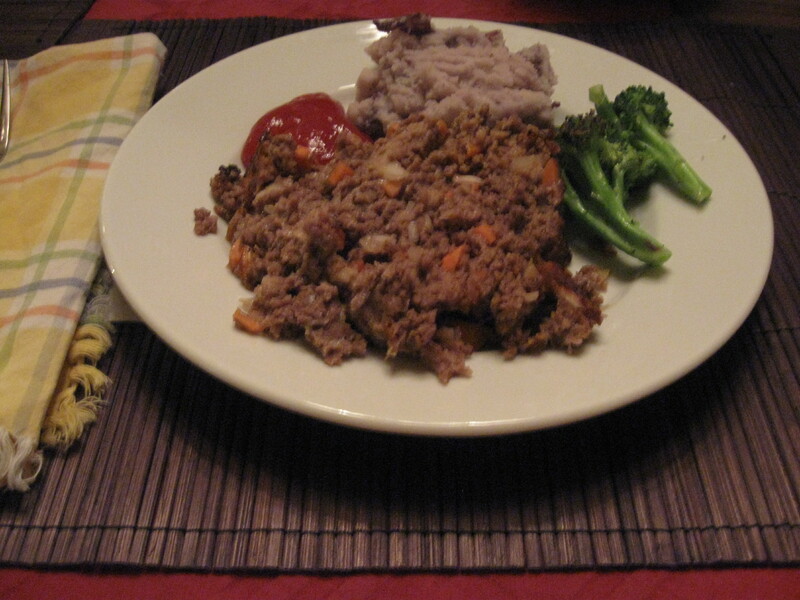 My son’s favorite meatloaf variation uses rolled oats instead of breadcrumbs. 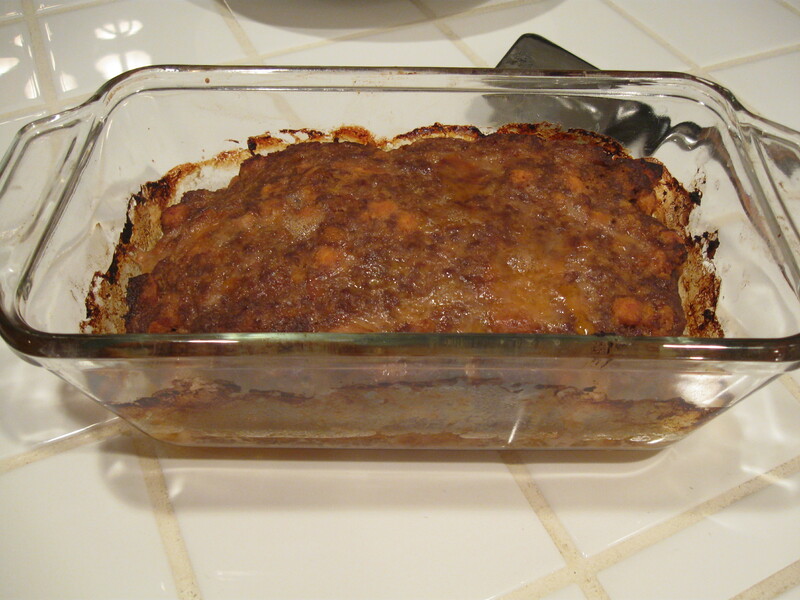 The result is a soft, moist meatloaf, but with a heartier flavor than breadcrumbs. Me, I have fond memories of my grandmother’s stuffed meatloaf (polpettone), which had a rolled-up frittata running through the middle of it. Delicious..and beautiful sliced on the plate! Your grandma’s version sounds awesome but time consuming. It takes me forever just to make the fritatta – I can’t imagine making one inside a meatloaf!